A timber frame home is crafted with trusses that are both functional, beautiful, and meant to be seen. This open, vaulted space holds potential to create an additional living space in your home. So, if you are building a timber frame home, why not consider including a loft? Where Should the Loft Go? The shape of your roof determines the amount of space available for a loft. The area above the great room, which is often below the apex of the roof, is likely the most practical position for adding a loft to your layout. The photo to the left shows a loft located above the entryway that looks over the great room below. To the right and left of the loft is a child’s bedroom. If you choose to connect your loft to bedrooms upstairs, the space could easily become an entertainment area. However, you should consider how that affects the spaces below. Establishing a game room for the kids directly above the place you plan to entertain adults could get noisy. What Can You Use Lofts for? Lofts can fill a variety of purposes. 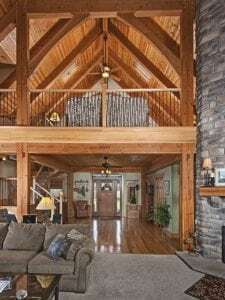 Riverbend Timber Framing homeowners have used their lofts for media rooms, craft rooms, offices, and even extra sleeping quarters. The best part of a loft is that you can add square footage without deterring from the beautifully exposed timber framing. In fact, a loft can get you closer to the timber frame. Your ideal layout might include a more secluded space to relax, like the library loft in the Dexter, Michigan Residence. Open to the great room below, this library can serve as a quiet, private space away from company. By including a television or computer, your loft can also function as a personal entertainment space. What if you do not necessarily need or want the extra space in a loft, but still plan to have rooms on your second story? 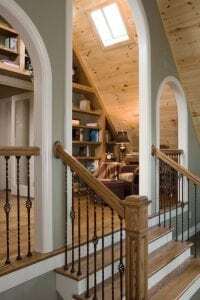 In this case, an open walkway that connects the staircase to one or both sides of the second floor could be the best option. Imagine a simple catwalk or a widened pathway to display your treasured antiques or collectibles. If you are considering a layout with a simple walkway instead of an expansive loft, the Tuscany floor plan is a great example of how a bridge can connect one part of the second floor to another. 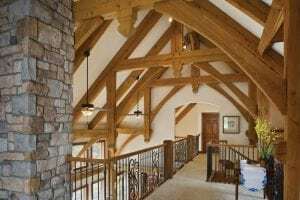 In addition, if you align your bridge directly under the timber trusses you can create an exciting architectural point of interest within your home. For more ideas for your timber frame loft, visit Riverbend’s timber frame loft photo gallery.